Fluff-free products. It is an uncompromising standard of EDUDPS. Jill Dixon, author of EDUDPS products, combines this standard with her belief in the 5 R's (Relationship, Real Learning, Reading, wRiting, and aRithmetic) to provide products that are "easy on the students, easy on the teacher, easy on time, hard on confusion, hard on delay, and hard on ignorance." Mrs. Dixon, a veteran homeschooler of 16 years, packages her expertise and experience (see her qualifications here) in over a dozen products, from diagnostic tools to a complete writing curriculum. I recieved four EDUDPS products for review: Write with the Best Vol 1, Write with the Best Vol 2, Roots and Fruits, and The Complete Career, College and High School Guide for Homeschoolers. A summary of each product follows. Overall, I liked what I saw. The no-frills and straight-forward approach fit in well with my style. True to the "fluff-free" standard, the curriculum spends only about eight pages of introduction and instructions before getting to the bulk of the program. Each unit is written directly to the student with very clear daily instructions, the first step being to read the model piece. The length of time varies with each genre; most of the units in Vol 1 were structured for about 10 days long, though some Vol 2 units were as much as 20 days. Each volume includes additional literary passages, grading criteria and proofreading checklists, "How to Write" guides for each genre and an answer key. While at first glance this program seems rather simplistic, further investigation found it quite meaty. Students analyze and dissect the writings of great authors in order to develop their own writing. Researching the author, underlining main points, looking up vocabulary and explaining what makes excellent writing excellent are all part of the process. Lessons are are targeted to take anywhere from 15 to 45 minutes. Some of the daily assignments were substantial enough that students may want to do them over a couple of days instead. The steps for each unit is incremental. For example, the first day's work for a short story unit involves reading the story and looking for particular elements (e.g. setting or plot). Day 2 involves a reread and writing down all the elements. On day 3, the student simply decides what the topic of his or her own short story and writes down a characters, setting and theme. Each day the student focuses on one or two aspects of their writing until they eventually have a finished product. In the end they proofread their own work, rewrite and place the piece in their portfolio. While the curriculum provides the parent with grading criteria, the step-by-step approach is meant for minimal teacher involvement. I like the step-by-step approach combined with the literary analysis. I especially appreciate that the proofreading checklists give students the tools to self-edit and revise their papers. The overall tone is not that of a textbook and the approach reminds me very much of one that we received from service that provided a paid writing consultant. The student is required to have ownership of their work and the process. Because it can be used with multiple levels, Write with the Best is especially an economical choice for those with large families. However, I felt that Volume 1 was a bit of a stretch of most in the 3rd-5th grade range. If your student can't identify adjectives, verbs and adverbs, extra practice work will be needed to fully utilize this program. The author gives recommendations to accomplish this as well as suggesting that students should not rush through the curriculum. In fact, the author emphasizes mastery of each needed skill before moving forward without a set time limit. She also makes suggestions on how to make this curriculum work for various learning styles and limitations (e.g. not expecting students with motor difficulties to take dictation). Roots and Fruits is a comprehensive vocabulary curriculum with uses the English forms of Greek and Latin roots and prefixes. It covers 673 roots and prefixes and 1716 vocabulary words. The end result will be improved vocabulary, reading and spelling skills. It is also excellent preparation for the important tests, e.g. at the SAT. This is not a workbook but a hands-on approach that will take around 15 minutes a day. Students will look up vocabulary words, regularly review roots, use words in sentences and play fun games to aid in learning each week. This curriculum holds to a Charlotte Mason approach that young children are able to learn more than most give them credit for. Jill Dixon provides a weekly schedule with a daily break down. Younger children should study only one root per week and older children two. For older students just starting the program, she suggests 3-4 new roots a week in order to master them all before the end of high school. This program can be used with all levels, making it another non-consumable economical purchase. With this career guide students explore their learning preferences, personality profile, work/service preference, and work environment criteria to narrow down possible career choices to suit the student. After calculating the results of the four self-administered assessment tests, students are to view lists of majors in each assessment area and select two per area that are of interest. From there the student is guided to possible occupations and goal-setting. The guide directs students on questions to ask when considering a particular career, exploration whether post-high school options, and potential interview candidates to learn from those in a field of interest. Suggested middle and high school course work, as well as activities and extracurriculars, for each area put students on the right path to achieving their career goals. How I wish I had something like this before I graduated high school. I had little direction in not only my strengths and preferences, but my options. Having selected a career that was likely not the best fit, I wonder what had been my path if I had a tool like this for direction. My daughter enjoyed taking the assessment, though the results were not surprising. For years she has proclaimed that she wants to pursue writing as a career and the results were true to that desire. However, there were several other areas to explore that were presented. By viewing some of the assessments, I also determined that having more group learning environments would be beneficial. While we have been on the right path with some of the coursework and activities, there are gaps. One particular course not yet studied showed up in the high school plan for several of my daughter's career choices, prompting me to consider this subject in the near future. I received the e-book format for all of the above products. In the end, I ended up printing all but the last item. Because these are non-consumable items that can be used over the years, the printed products work best for me. Those that like the convenience of e-books need to be aware that the download versions come with very strict security features. Only two print-outs are allowed and you may not download to more than one computer nor put the file on a memory stick for copy store printing. Having experienced piracy of their products in the past, EDUDPS has good reason for going this route. You can read their story here and learn more about the e-book restrictions at the free download page. If these restrictions may pose problems, you may want to consider purchasing one of the printed versions instead. In addition to the above products, EDUDPS also has several diagnostic products and guides available. To find out more, visit the EDUDPS website. *For a limited time, all e-books are 25% off. Prices listed above do not reflect the discount. I had never heard of lapbooking until I started homeschooling. Even then, I wasn't really sure what it meant. Reviewing items for the TOS Crew has stretched me in many ways, and lapbooks are no exception. Lapbooks can be best described as homeschooling meets scrapbooking. A hands-on activity that results in a creative portfolio of subject matter studied and learned, typically of a single topic, lapbooks are perfect for those who do unit studies. Students create mini-books, paper crafts, pop-up displays, pictures and arrange them on a file folder for a wonderful visual display, which can easily be kept as a record or material learned or for future review. I'll have to admit that I'm not particularly fond of paper crafts nor are my kids. However, I can see the appeal of lapbooks for those that are more craft-inclined. They are hands-on, a great display showpiece, a wonderful visual review tool, and a fun keepsake. A Journey Through Learning, founded by two homeschooling friends, makes this creative expression easy for busy homeschool moms by providing lapbook kits in either download or printed form. I was sent five lapbooks in e-book form for review: Amphibians, Autumn, The Desert, Reptiles and The Parables of a King. Each of these titles is a combination lapbook kit and study guide ranging from 56 to 88 pages. The first eight pages or so are devoted to instuctions on how to make the folds, options for using the materials, tips and tricks and pictures of how the finished product should look. The bulk of the remaining pages are the study guide and print outs for the lapbook. The last few pages are enrichment activities. The enrichment pages are the same for each title and include reading suggestions, forms to record books read, outline pages, and narration pages for younger children. Four of the titles were for grades 2-7th, with The Parables of the a King for 2nd - 8th. Of the 48 titles sold by A Journey for Learning, the majority fall within this range, though they do have a handful of titles available for younger children. Doing one study guide page and mini-booklet a day, a lapbook should take about one month to complete. Of course, this can be shortened or lengthened as needed. Just as homeschooling, these lapbooks have flexibility to fit your studies. I am definitely not a seasoned lapbooker, having only one lapbook to my name prior to viewing the titles from A Journey Through Learning. As a lapbook newbie, there were several things that were appealing in these titles. Study pages - each lapbook component or mini-book has a study page covering the material. These pages can be used as stand-alone or as a jumping off point. Areas to complete - some of the mini-books have areas where the student is to write thoughts or somehow complete with information not directly given. This is in contrast to other lapbook kits that are more cut and assembly. Easy assembly - use of three file folders simply attached for one large lapbook with color-coded instructions. I feel the lapbooks are a bit too young looking in general for the upper age range. Older kids are going to be unimpressed with the simple folds and cuts, especially if they've done other lapbooks. Many of the graphics were cartoon style clip art, though some lapbooks utilized actual photographs. My almost teen, who is a 7th grader, is well beyond the material and look of the lapbooks. Level appropriateness varied for my 5th grader. The Autumn title, for example, seems very young for that age. You can see sample pages of the Autumn lapbook here. Others have information that would appeal to multiple ages. Sample pages for most all of the titles are available at the A Journey Through Learning website. I would suggest checking out the sample pages of individual titles if your kids fall within the older end of the suggested range. If the lapbook is being used with multiple ages, it would be easy enough to supplement for older kids. However, I felt the age range (2nd - 7th) was too wide in general. These lapbooks would be perfect for those just beginning, especially with grade school aged kids. To get a better feel on how these lapbooks are put together, click here for a picture tutorial on how to glue the folders together as well as a picture of a finished lapbook. The home page of the website has a slide show of finished lapbooks for viewing as well. Lapbooks are available in three verisions: instant download ($13), CD ($14) and printed ($21). Printed versions include necessary file folders. Costs vary on other titles. Shipping is always free and items can be returned if you are not satisfied! A Journey Through Learning also has notebooking pages, copywork, and unit studies available. To try out a lapbook for FREE, you can get an instant download of An Overview of the 17th Century at no cost if you sign up for the newletter. That isn't healthy for you. Oh my - look at the fat content in that snack. There is too much sugar in that. You need to eat less junk! I'm sure we've all told our kids, or even ourselves, a variation of the above just prior to consuming some less-than-healthy snack. I don't know about your house, but in mine, the typical response is not, "Why, thank you for the reminder, mother. I think I'll eat this apple instead of these Oreos!" Rather, my kids' reaction is usually similar to when I say, "You need your rest, " and "You'll need to know this stuff when you are a grown-up!" They comply, but not very willingly and not without the giving the sense that they feel like they are being nagged. Wouldn't be nice if your family was on board with making healthy choices and how they fit in with God's design of our bodies? It is our mission to honor God by creating and distributing products that educate and empower His children to establish healthy, Christ-centered homes. 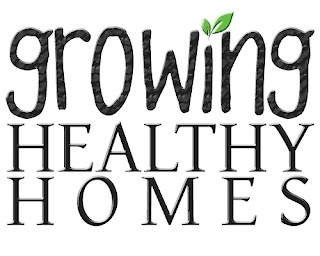 We established Growing Healthy Homes LLC in 2007 to educate and train families regarding God's plan to optimum health as outlined in the Bible. We are wives, mothers, researchers and teachers dedicated to reaching homes with a message of hope and healing. Our product line includes family-centered and health-infused books/e-books, as well as educational materials for user of pure therapeutic-grade essential oils. The text is very visually appealing, with bold color photographs, charts, tables, boxes with fun facts and more. You can view a full table of contents, read more about the authors, and see various portions of the units and appendix by clicking here for the 26-page sample. Each unit starts of with an introduction, often including Scripture for reference. Four chapters are included for each unit. Most chapters include about 8-10 pages of text information, followed by discussion questions, activities and a list of additional resources. Activities for both elementary and secondary students are included to allow for group teaching of multiple ages. Next comes the part that every student, from young to old, is sure to enjoy - cooking and eating! Each chapter includes a recipe that relates to the topic discussed, allowing the students to put their new-found knowledge into immediate action. For example, Chapter 3 in Unit 5 discusses the immune system. This chapter defines the immune system, discusses the lymphatic system, covers disorders and diseases of the immune system, gives information on how to boost the immune system, shares a list of good foods and bad foods and more. There are three discussion questions, eight elementary activities, a choice of six secondary activities and a list of four additional resources. Discussion question: How can you tell a T cell from a B cell? Elementary Activity: Draw a picture of a white blood cell phagocytosing a germ. Secondary Activity: Research scientists Ilya Mechnikov and Paul Ehrilch. Prepare a written or oral report discussing what they discovered and why their discoveries were important. Additional Resource: Vaccine website link. After reading and discussing the material and trying out some activities, students will make and eat a Mixed Berry Salad. Additional nutritional activities, for both elementary and secondary students, are included on the recipe page. For this particular chapter, researching kiefer and arranging a field trip to a berry picking farm are among the suggestions. I felt the reading portion was geared more towards older kids, approximately middle school and up. However, because of the variety of information and activities presented, teaching this course as a group or with mixed ages within a family is certainly feasible. And, really, changing eating habits should be a family affair! Younger students will enjoy scaled back information of the material presented, completing activities and, of course, cooking and eating! 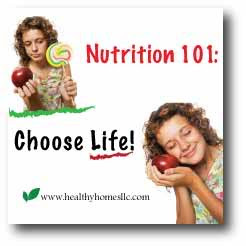 What I particularly like about the information shared in Nutrition 101 is that much of it is the type of practical information you'd get from other moms concerned about health issues, in addition to your more textbook information. Understanding the science behind the body paired with information like reading labels, the dangers of microwaves, warning signs of deficiencies or toxic exposure, and how to select fresh produce gives students both the knowledge and the action. It not only explains the why but the how, hopefully eliminating the need for "because I said so" and creating a desire in children to want to make healthy decisions and become healthy adults. The simple volume of this product, a blessing in many ways, personally made it difficult for me to navigate as an e-book. For review, the Crew downloaded the product, though the e-book is sold on a Cd-Rom on the website. The file was huge! I opted to have the complete book printed at an office supply store, something I don't often do with e-products. However, this product is more than a text and includes many reference materials. Having a printed copy will be convenient for continued use. I recommend that you purchase the combo of both the Cd-Rom and the printed book if it is within your budget. The Nutrition 101 Cd-Rom sells for $79.95. You can pre-order a printed book for $99.95 or get both products in a combo package for $129.95. Multi-user licenses are also available for co-op classes. Visit Growing Healthy Homes website for more information on this product. Be sure to check out the free audio downloads as well! I love study aids and gadgets. I've purchased gizmos to hold papers hands-free, booklights of various sorts, a portable typing device that allows you to transfer work to the computer, aids to help with tracking when reading and book holders. Anything to make the studying process easier and refocus on learning is a potential purchase for our homeschool. When the Crew was informed a Studypod by Genio would soon arrive, I hadn't an inkling what it could be. After a quick visit to the website, I saw that it was a book holder. While a book holder is already among our study tools, just as one can never have too many books, any extra book holders are welcome in my home! I wasn't sure how innovative a book holder could be, but I would soon find out. Designed by a teacher and students, the Studypod is quite the gadget. After several simple steps to set up, the Studypod is ready to use. An instruction sheet comes with the product but I didn't need it after the first set-up. The video below should answer all your questions on putting your Studypod to work. With the adjustable support arms, it can hold virtually any size book. It is lightweight and collapses to a size similar to that of a hardcover novel, making storage and portability a cinch. A storage pocket is located on the inside and there is additional room to hold pens, pencils, and a calculator. 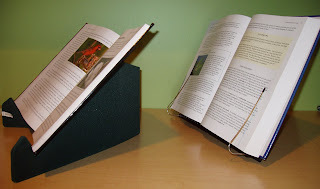 One of the main advantages of this book holder over others on the market is the angle which it holds the book. Similar in angle to a computer screen, the Studypod reduces neck strain and helps to maximize focus. Below is the Studypod (right) and another brand book holder (left) we've used in past for side-by-side comparison of the difference in angle. Also note that the Studypod takes up less valuable desk space. The angle of Studypod is especially helpful when using a text with a computer. 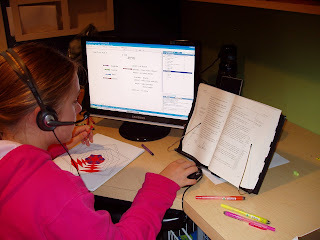 My daughter has online classes and she loved using the Studypod to hold her course text for reference, leaving her hands free to use the keyboard and mouse for class interaction. The arms that hold the pages open and secure are another unique feature. No more flipping of pages and loosing your place in the middle of a project. One of the first uses of the Studypod in our household was to prop up a drawing book. Similarly, it would be perfect for holding open cookbooks and music pages for hands-free reference. To turn the page, just slip the page out from the arm or pull the arm back to completely release the page. I loved that the arms adjusted to the size of the book. The book holder we previously owned was too large for the book being used in the above picture. The Studypod can hold both our large textbooks and smaller paperbacks. Since my daughter has claimed the Studypod as her own, I'll have to take advantage of the a $5 off coupon that Genio is offering for one of my very own. Just enter code TSBLOG5 when placing your online order. The Studypod is available in black, blue or pink and retails for $19.95 or two or more for $16.95/each. To order, visit the Studypod website. Someone recently shared the following article during a discussion about rebellious teens and children walking away from their faith once they leave home. The author, Reb Bradley of Family Ministries, touches on several points that I've never seen addressed so directly. It truly is a must-read. It addresses homeschool families, but any Christian parent would benefit. The theater bug that is! It was no mystery when my daughter was younger that she would love theater. She's loud. She's imaginative. She loves to perform and belt out tunes. Unfortunately, there weren't many theater opportunities in our early homeschooling years. Things changed several years ago when some moms in my homeschool support group decided to try their hand at a homeschool production. The end result was fabulous and put any school production with similar aged kids to shame. Everyone loved the experience and the group has since turned out two more productions. While I knew my daughter would love theater, I was surprised to find out that my son did as well. This is the same boy who used to hide behind my legs and pretend he couldn't hear whenever an unfamiliar adult or child approached him. Last fall the theater fever in our house continued to climb when my kids decided to branch out and audition with a local theater company. 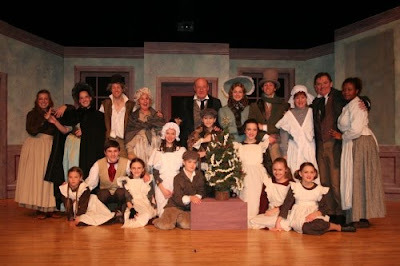 Every other year this youth theater invites children to audition for A Christmas Carol. I thought it would be a great experience to audition, but didn't expect my kids to get a role given the numbers who turn out for the parts. I was proven wrong when they both received parts. The shy quiet child played Tiny Tim! A few weeks back the same theater group put out a casting call for their Little Women production and mentioned they would consider a homeschooled girl age 12-14 for one of the parts. Of course, my daughter was game. This audition was a bit different since adults were also trying out for the one part also open to children. The audition requirements were different as well. A monologue, resume and head shot were required in addition to preparing a song as last time. Also, there was only one part and some of the competition were friends. The audition was on a Wednesday and my daughter was called back for Friday. Sadly, her friends didn't make the cut so she was torn with excitement and disappointment for them. The callback audition was 2 1/2 hours long and had more participants than expected, including another child for the same role. I was impressed at my daughter's confidence, despite knowing the odds. By the following Wednesday, she received a phone call offering the part of Amy. She held the huge smile throughout the conversation and followed with squealing and bouncing after the hang up. Theater has been a wonderful experience for both of my children. It was been an outlet for my rambunctious child and a safe form of expression and confidence builder for my quieter child. My kids have learned much - from public speaking, presentation, dealing with mistakes, managing multiple commitments to team work. I highly recommend having your children try theater at least once. Yep - I'm afraid this bug may now be chronic. My husband is pretty uninvolved in the day-to-day aspects of our homeschool. He trusts me to educate the kids and doesn't step in unless I request Daddy intervention. On occasion, though, he'll bring home something that shows our little homeschool is always on his mind. He brought this little treasure home from work yesterday. The "sass factor" has always been high with one child in particular, who would rather be outside riding a bike or playing with Legos. 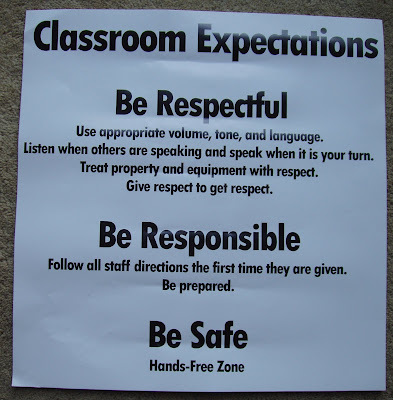 My husband made sure to review the classroom expectations of our homeschool with said child, especially the "Follow all staff directions the first time they are given." As homeschoolers, most of us abhor the standardized test and would much rather focus on learning. Frankly, the current model of the pubic school system to teach to the test and nothing else is reason in itself to homeschool. However, like it or not, there comes a time when standardized testing has very high stakes. College admissions. If you have a college-bound student, you are probably acutely aware of the importance of an impressive SAT or ACT score for acceptance and offers of scholarship by the school of your student's choice. Let's face it, college admissions can be pretty cut-throat and competitive. It is a game of one-up. It is a game of evaluating 13 years of schooling largely by a single test score. With homeschoolers who often have transcripts of “Mommy grades”, this is especially true. If you are going to play the game, you need to know the rules. Knowing the rules could pay off big in attractive offers and even full scholarships. COLLEGE PREP GENIUS explains the rules and gives students specific plays to stay in the game. Author Jean Burk has over 10 years experience preparing students to take the SAT. Through her DVD course, book and workbook, students will learn common patterns of SAT questions, tricks to answer questions more efficiently and unique acronyms to learn recommended steps of approach for each type of question. While my oldest has taken standardized tests before, her preparation consisted of little more than learning how to transfer answers from the booklet to the answer sheet and to bubble cleanly. Beyond that, it is her knowledge that has carried her scores. Standardized testing has always been used as a tool for my own information, a basic measurement of how our homeschool was doing with an outside tool. However, I can't deny the stakes involved in tests like the ACT and SAT. Well-trained athletes know the rules of the game and the likely plays of the opponent. Coaching on the rules of the SAT will allow your student to better show their abilities. Over the next few weeks, I will be having my daughter go over some of the material presented in this course. We'll start with a retired SAT test, as recommended, for a baseline. After going through the materials, I'll report back on how this product worked for our family. In the meantime, you can check out the COLLEGE PREP GENIUS website and browse the articles found there. For a limited time discount, the entire COLLEGE PREP GENIUS DVD set only costs $79, which includes the revolutionary textbook, workbook and teaching DVD. That’s 30% off the retail price! Be sure to check back for a personal review of this program. Subscribe to The Old Schoolhouse™ Magazine for only $7.95! At first I thought my kids were coming down with some bizarre virus. Or maybe they just have some strange allergy. It is the weirdest phenomenon. Every time I ask them a question, all they can say is, "Wuzgonnadoit." Yep, must be allergies...to work! I'll have to try out this new wonder word of theirs next time they ask, "When's dinner?" or "Did you wash my favorite pair of jeans?" Wuzgonnadoit. Do you think they'll bless me? Those of you that followed my reviews last year may recall my review on Aleks, a web-based service that utilizes artificial intelligence for comprehensive math instruction for grades 3-12. . Aleks wasn't new to our family at the time; we've used it as a supplement in the past. Still, it was nice to revisit the program for the review. You can read last year's review here. I've been asked to revisit Aleks once again as part of the 2009-2010 TOS Crew. Specifically, I was to take a look at some changes made to the Master Account features based on customer feedback. One of the positives of using Aleks is that students have the opportunity to independently learn mathematics. 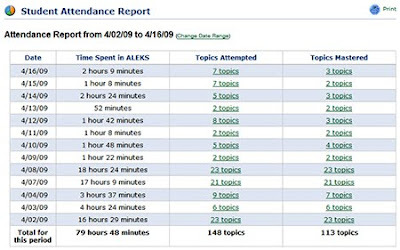 In the past, the overseeing parent or teacher had access to progress reports or could visually view progress on a pie chart, a unique feature of Aleks. Parents could also request an assessment test at any time and reassess the students placement. All of these features are still available. However, two new features have been added to assist parents and teachers in utilizing this program even more, while still maintaining independent learning. The first is the attendance record. Rather than a running total of weekly time spent and items learned per hour, parents can now view daily records. A click of a button give a daily breakdown of how long the student logged in, how many topics were attempted and how many topics were mastered during that time. At a glance, it can quickly be determined if little Johnny is moving through the material, stuck on a concept or is perhaps sneaking time IMing friends or playing World of Warcraft rather than mastering new topics while still logged in to Aleks. Not that any of us have disobedient children(! ), but extra accountability is always a good thing. The other added feature is the ability to set up quizzes for your student. Different from the random or requested assessments, which can be quite lengthy, parents have more control over the quiz length and content. 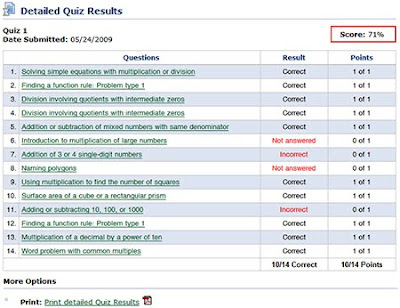 Parents can select content and number of questions to appear on the quiz. Once the student takes the quiz, parents can view results and even create a printable report of the quiz questions and answers. Click here for a sample printable quiz report. Below is how the results page appears. I'm always impressed with companies that not only take the time to talk and get feedback from users, but who actually listen and implement changes to their product as a result. The new attendance and quiz features are nice additions to the program and help busy homeschooling parents to get the most out of the program. Visit the Aleks website to find out more. There is a free 48-hour trial on the website, but Aleks has a special offer to new users for an extended trial. Click below to find out more. 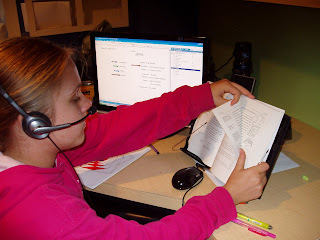 Also be sure to read the full reviews of the new 2009-2010 Crew members who are giving Aleks a try in their homeschool for the first time at the TOS Crew official blog.